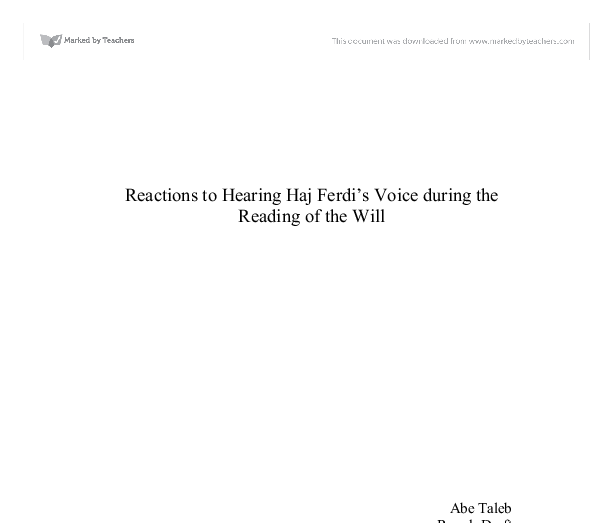 Reactions to Hearing Haj Ferdi's Voice during the Reading of the Will Abe Taleb Rough Draft D-0336-011 1/16/05 In Heirs to the Past, Haj Ferdi, or the Seigneur, was the central figure in his community. Not only the patriarch to his family, but is in a position where most of the people in the surrounding town look up to him not only as a role model, but also out of necessity for life. "My mother emptied the food into a bowl and told one of my nephews to go and distribute it to the poor. He had not far to go; he had only to open the front door and there the poor were." (Chraibi, 50) The poor depended upon the Seigneur for food and distant family members depended upon his charity to avoid becoming impoverished. "All were members of our family, or our wife's family, either cast aside by fate at whose door all ills are placed..." (Chraibi, 70) The Seigneur's death brought great sadness to his family members and those that he was close to, but it also brought up the question of how exactly would his estate be distributed. If one hears a dead person's voice, especially someone close to them, a feeling is created as if the person has come back and is truly speaking to them, which is much more emotionally charged than hearing a will read by a lawyer. ...read more. would make the Seigneur think less of him while in his presence, but he still acts aggressively when he feels that it would help his family. Upon the peaceful request of the Seigneur, Nagib harshly forces everyone out of the room where the reading of the will was taking place. "And Nagib calmly sat down and watched the tape turning. And I, who knew him well, realized that he was unable to master his pain." (Chraibi, 72) Even through all of his aggression, Driss could see that Nagib was emotionally touched when hearing his father for the last time. The effect of hearing the Seigneur again caused Nagib to calm and instead of trying to be the dominant figure in the meeting, he would try to listen and understand the Seigneur's message. During Nagib's part of the will, the Seigneur tells him of his greatest fault, which is when he encounters a difficult situation; he solves it without empathy or compromise, but uses force. The Seigneur tells him to restrain himself, and only use force when law has broken down and the head of the household, Madini, requests his help. Rather than fight his father, as he would do to most people, Nagib accepts his father's advice and the decisions that he made regarding his future. ...read more. The most powerful effect of hearing the Seigneur's voice was applied on Driss after hearing the Seigneur's voice address his family members, but only hearing silence when the Seigneur should have addressed him. The effects of hearing the Seigneur's voice, but feeling only rejection, caused Driss to spend the rest of the book in a pursuit to understand the message that the Seigneur was trying to allow Driss to discover on his own, showing that the greatest effect of the Seigneur's voice in the will was indeed used on Driss. 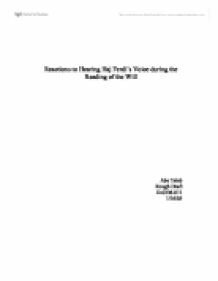 The effects of Haj Ferdi's, or the Seigneur's, voice upon his family members was great. He left a lasting impression on his family members along with his last wishes that he requested that they carry out. The calm and commanding tone of his voice could relieve the family of sorrow only ten days after his death, and convince them to put aside any bickering about personal matters. He helped them see the value in each other, and was able to fit what they received from the will to their personalities. Even death could not stop him from affecting the people closest to him, and offering advice that would stay with them for a long time after his death. ...read more.